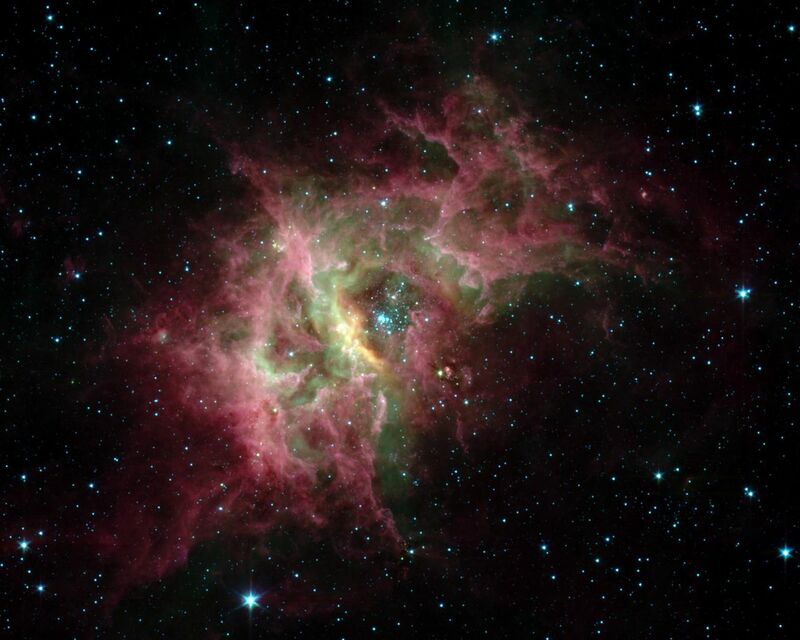 One of the most prolific birthing grounds in our Milky Way galaxy, a nebula called RCW 49, is exposed in superb detail for the first time in this new image from NASA's Spitzer Space Telescope. Located 13,700 light-years away in the southern constellation Centaurus, RCW 49 is a dark and dusty stellar nursery that houses more than 2,200 stars. Because many of the stars in RCW 49 are deeply embedded in plumes of dust, they cannot be seen at visible wavelengths. When viewed with Spitzer's infrared eyes, however, RCW 49 becomes transparent. Like cracking open a quartz rock to discover its jewels inside, the nebula's newborn stars have been dramatically exposed. 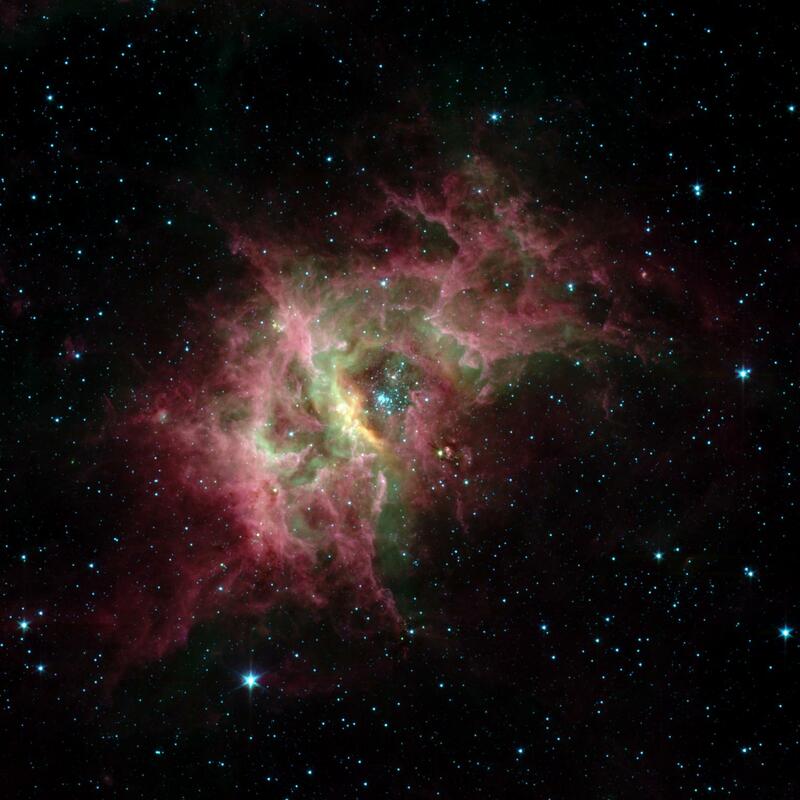 This image taken by Spitzer's infrared array camera highlights the nebula's older stars (blue stars in center pocket), its gas filaments (green) and dusty tendrils (pink). 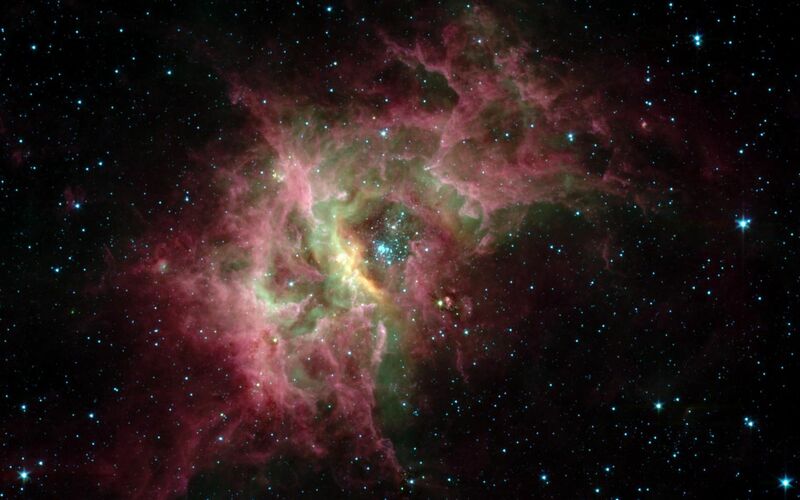 Speckled throughout the murky clouds are more than 300 never-before-seen newborn stars. Astronomers are interested in further studying these newfound proto-stars because they offer a fresh look at star formation in our own galaxy. This image was taken on Dec. 23, 2003, and is composed of photographs obtained at four wavelengths: 3.6 microns (blue), 4.5 microns (green), 5.8 microns (orange) and 8 microns (red).